During the first day of free agency, fans of the Penguins rode quite the emotional rollercoaster. Some usual names, some players we have come to know better than some of our family members waved goodbye and sailed steadily into the loving (or not so) arms of another team. We bid adieu to Matt Cooke, who most likely received two minutes in the sin bin at some point during the signing process with Minnesota, where he will fall under a familiar face in Mike Yeo, former Assistant Coach of the Pittsburgh Penguins. Oh yeah, did I mention perennial third liner Tyler Kennedy was traded to San Jose for a second round pick (yeah, seriously). We wish him all the best, and may there be plenty of space wide of the net to send all of his poorly timed shots. We also said adios to some that we expected we would not bring back. Jarome Iginla decided to trade in his black and gold for some slightly different black and gold, and make good on some trade deadline rumors from last year. It seems apparent that the rest of the bunch of aquisitions from Sherofest 2013 will turn out to be just what most thought they would be. After all, the experiment failed right? Maybe we were missing -The- Piece.. Remember 2009? It was a decent year for Pittsburgh Sports. In fact, if the Pirates had been playing the way they are now, we might have had a shot at The Triple Crown, but alas we had to settle, which becomes much easier when you can settle with Lord Stanley's Cup safe and secure in your teams arms and your owners pool. We had a different team back then, our defense was anchored in large part by Rob Scuderi, a man who had been bestowed upon the nickname of "The Piece" due to a much parodied interview in which he described himself as "The missing piece to the puzzle" rather than "a missing piece" some say he misspoke, looking back however he may have been right on the money. His blocked and covered shot in Game Six at Mellon Arena all but ensured a 2-1 victory, and a chance to dance with destiny in Detroit. It was there, in front of the residents of "Hockeytown", that the Pens would take home Cup number 3. Speaking of money, we ran out of it during the 2009 offseason, and Scuds left to pursue the greatest trophy in sports in another town wearing a different sweater. He commanded a $13.6 million contract which kept him in The City of Angels for 4 years, and landed him another Stanley Cup. Ray Shero, General Manager of the Penguins, was recently quoted as saying that it was a major mistake on his part to let Scuderi go, and if he had the chance he would try and make it right. He got that chance on July 5th, 2013, where a simple phone call and 13.5 million dollars landed Robert Scuderi back in the Steel City. At 34 years old, Scuderi has shown that he still has some juice left. What we loved from him in 2009 largely remains intact, his grit, knowledge, and heart is something measured not in indivudual stats, but rather in the success of the teams of which he is a part of. 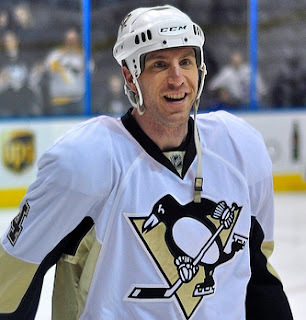 Rob Scuderi could be a great asset to a team chock full of young, raw defensive talent. Much like he took on the role of Mentee from one Sergei Gonchar after being brought up from Wilkes-Barre, Scudsy could take on the role of Mentor to the likes of Simon Despres, Olli Maatta, and Derrick Pouliot, just to name a few. The future of our defensive corps looks brighter with Rob Scuderi in the picture, and we can thank Pens Management for taking one big mistake, and making right on a difficult situation by filling a void that had never been repaired, with the player that left it in the first place. "The Piece" of the puzzle that should never have gone missing from the box.